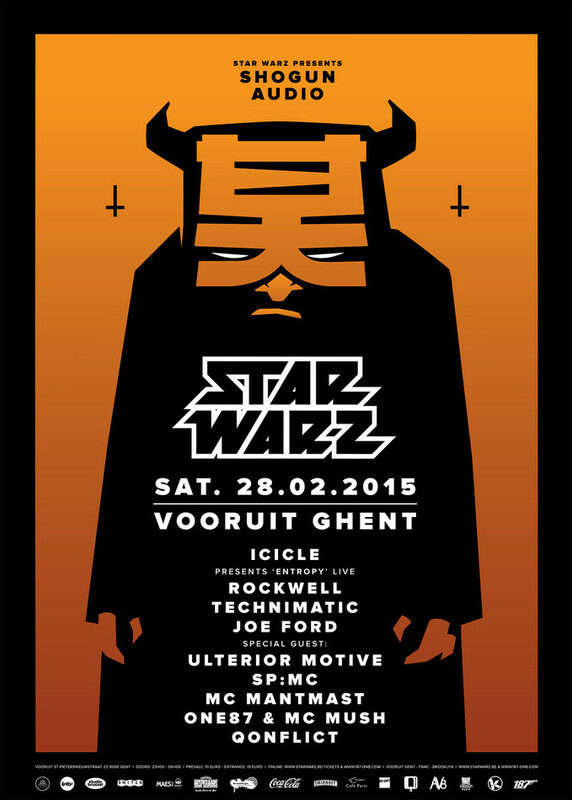 Star Warz remains thé event of choice of all leading Drum ‘n’ Bass labels around the world to showcase their talent in Belgium. It is also Tomorrowland’s event of choice to showcase Drum ‘n’ Bass on their best festival of the world. What more do we need to say? After many amazing nights from the world’s leading Drum’n’bass labels Metalheadz, Ram Records, Virus Recordings, Critical Music, Exit Records & many more, this time it’s Shogun Audio’s turn again! Since its inception in 2004 Shogun Audio has gone on to become one of the most essential labels in dance music today. Driven by its founders Friction and K-Tee the Shogun brand has developed into an all-encompassing Drum ‘n’ Bass juggernaut releasing some of the most breath-taking beats across the full spectrum and beyond. The ethos – if it’s good music, let’s get it out there! Behind a high-rolling label are high-rolling events. The Shogun Audio sessions at London’s Cable club and Brighton’s Digital have become synonymous with the best nights out in the country and across Europe. So with now over 40 Shogun events every year all over the UK and as far afield as Australia, Russia, Hungary, Croatia and Austria it’s true to say the brand is well and truly worldwide. With their continued Shogun podcasts, their own shows on Ministry of Sound radio, Rinse FM and now also BBC Radio 1’s Drum & Bass Show, there seems to be no stopping Shogun Audio. 2014, the year of their 10th B-day, was an amazing year for Shogun Audio. They travelled the world (and also celebrated their anniversary at Star Warz early 2014) and released several great albums. The first featuring ’10 Years of Shogun Audio’ - a truly special and collectable release to mark their 10th anniversary in style. The second ‘Shogun Audio presents 2014’ includes sixteen essential tracks from 2014. Including a continuous mix from Joe Ford it also features music from Icicle's breathtaking sophomore album Entropy, Technimatic's summertime smash debut album Desire Paths, plus some classic re-releases such as Rockwell's '1_2_3_4' & 'Sick of It All' & Friction's first 'Vs' single. 'Shogun Audio Presents: 2014' draws a line under 10 years of the label as it begins to look forward. And looking forward is what they will also do on their visit at Star Warz on February 28th. Highlight of the night will without a doubt be the live performance of Icicle. He is recognized as one of the most technically advanced and highly-respected producers in electronic music. Mastering tech-funk better than any other, Icicle’s music is graceful yet daring and, without doubt, technically remarkable. His second album ‘Entropy’ on Shogun Audio is one of the most prime and compelling examples of hybrid dance music yet seen in 2014. It was immediately proclaimed ‘Album of the Month’ in leading dance-magazine Mixmag and applauded in many other media. We at Star Warz will be able to enjoy it live! Next up Thomas Green – aka Rockwell - has without question been one of the most exhilarating talents in electronic music in recent times, since being included in the accolade of MixMag’s 2010 Players of the Year. Comfortably one of the scene’s most distinctive, talented and sought-after producer-DJs, Rockwell stepped up his game by signing exclusively with Shogun Audio. And always room for new talent on both Shogun Audio and Star warz which this time comes in the form of Joe Ford, a man on a mission, ready to shake up the world of D&B and beyond with his unique brand of bass music. Hailing from Harrogate UK, at just 21 years old, Joe leads a new wave of producers currently taking the scene by storm. Musically rich, emotionally charged and evocative Drum ‘n’ Bass has fast become the trademark sound of Pete Rogers and Andy Powell aka Technimatic, now firmly established as a mainstay of the Shogun Audio roster. And also they released a seminal album in 2014: ‘Desired Paths’ is their debut album on Shogun Audio and also hailed as a masterpiece by press and fans alike. And then some special guests in the form of Ulterior Motive who have their home with labels as Subtitles and Metalheadz but there is a link with Shogun Audio as they have collaborated with Rockwell. And also they had a well received album out last year: “The Fourth Wall’. This impressive list of leading players will be professionally accompanied by the biggest MC’s in the field as both SP:MC and MC Mantmast will join them to liven up the night with their glorious lyrics. And no Star Warz without its resident One87, skillfully joined by MC Mush. Qonflict, winner of the Star Warz Dj contest, will open the night. Ready for some serious bass and breaks madness? Then we would love to welcome you on Star Warz’ first edition of 2015!